SURVEY: Has your faith been enhanced or restored through a Fuller Center experience? Time and time again, we have seen people who had stepped away from their faith or the church do an about-face after having a positive experience with The Fuller Center for Housing. We have seen faltering churches and dwindling congregations rejuvenated by tackling a Fuller Center project. 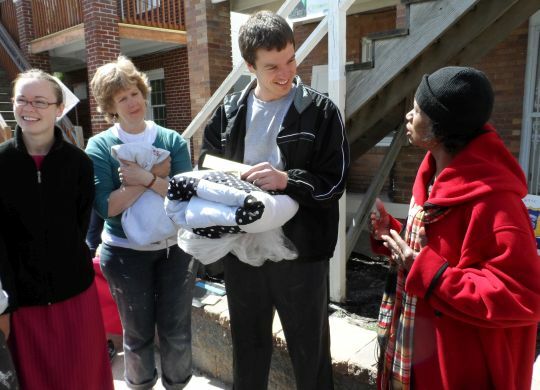 As an ecumenical Christian nonprofit housing ministry, we’ve worked with just about everybody. Our homeowner partners, volunteers and supporters have included Christians, Hindus, Muslims, Buddhists, Jews, nonbelievers, the “spiritual but not religious” and still others. When it comes to Jesus’ instruction to “love thy neighbor,” we do it through helping them have simple, decent places to live. And that “love thy neighbor” philosophy appeals to a broad range of people beyond Christians. At a time when church attendance is declining and more people each year identify as non-religious, we believe that demonstrating love for others through the Theology of the Hammer is a powerful way to shine a light and show what true Christianity is all about — loving our fellow human beings. In 2018, we want to share more stories of people whose faith has been enhanced, strengthened or restored through their experiences with The Fuller Center for Housing. We also want to share stories of those who do not necessarily identify as Christians but appreciate The Fuller Center’s basic principles of extending a hand-up to families in need of simple, decent homes. Do you have a personal story that you would like to share with others? Your testimonial could be the story that moves someone closer to Jesus Christ or opens eyes that had been shut. If you would like to participate in our collection of testimonials and stories, please fill out our survey below. We’d love to hear from you! And if you know of someone who has such a story to share, please forward this post to them and encourage them to get in touch with us. Have you had an experience with The Fuller Center — in general or specifically — that has strengthened, enhanced or restored your faith? During 2018, we will be contacting people and doing stories about such experiences. If you have such a story you'd like to tell, please provide a brief summary of your experience below. Some survey respondents will be contacted for further interviews so that we can share stories on FullerCenter.org and The Fuller Center's social media outlets. Or, do you consider yourself non-religiously affiliated, spiritual but not religious, a nonbeliever, or other but are involved in or support The Fuller Center for Housing's efforts to help people have simple, decent places to live? If so, we'd like to know why you support this affordable housing ministry. We'd also like to feature some of these stories in 2018. (Optional) If you belong to a church, please let us know the name of the church below. We'd like to share your story with church leaders. Please provide your contact information so that we may be able to get in touch with you. The following fields will not be shared publicly.